Lyse gule fargen gir umiddelbar anerkjennelse, angir et trygt våpen til området sikkerhet offiserer. Solid bygd for å tåle utilsiktet bolt slamming. Bøyd probe forblir i kammer med bolt åpen. Godkjent for DCM/NRA konkurranse. SPESIFIKASJONER: Plast, gul. 5½"(14cm) lang. Purchased these chamber safety flags for use in metro police department. 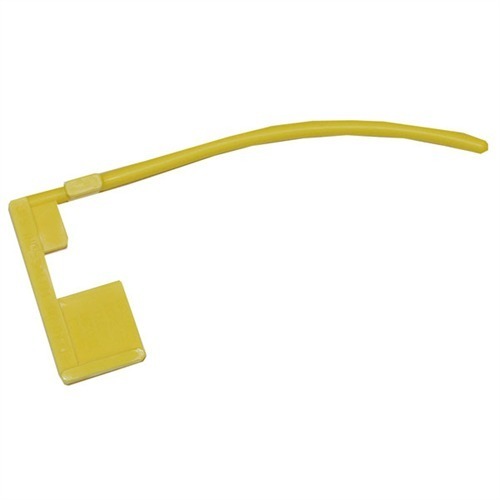 They are made of durable, high visibility plastic that should hold up against multiple bolt closings. The flags DO stay in place with the bolt open, as stated. Great product, easy to use, great price! These things just work. They stay in. They're visible. They're virtually indestructable. They're priced right - packages of 3. One of my local ranges requires flags. They're just a good idea anyway. This chamber flag is very good quality. It is much more "substantial" than the picture would lead you to believe. It is definitely not flimsy. The long plastic piece that goes into the chamber and bore is slightly curved, and that prevents it from falling out. Nice touch. I use this chamber flag in a bolt action target .22LR rifle when I am at the range. Works great. I have no doubt that it can also be used in pistols or larger caliber rifles. I highly recommend it. Produsentnr. : 14475 Lyse gule fargen gir umiddelbar anerkjennelse, angir et trygt våpen til området sikkerhet offiserer. Solid bygd for å tåle utilsiktet bolt slamming. Bøyd probe forblir i kammer med bolt åpen. Godkjent for DCM/NRA konkurranse.